After more than nine years of computational effort, I broken into the top 4000 SETI contributors today. #3996 out of 1418448 user to be exact. I'm generating almost 10,000 work units a day. I should be able to break into the top 2000 with my current systems. But the top 1000 will be tough. I'd need a big boost to get there. But maybe I can work some magic. My stats are here. My younger brother, Jason, wrestled with his first cancer screening this morning. He did real well afterward and was back to normal by lunch time. No signs of any problems. And he was all worried about nothing. I think he said he won't need another screening for five years. I'll probably get another one in three years, if not sooner. The amount of discomfort required for the exam is greatly outweighed by the knowledge that you're cancer free. And colon cancer is nobody's idea of a good time. Yes, it was the same thing that happened a couple of years ago. Her potassium levels dropped and her heart came close to not having the essential elements required to do its job. As far as I know, the solution was to give her intravenous potassium for three days. She shares the symptoms with her mother. But her mother didn't have similar issues until she was well past 55. I think it is a genetic pre-disposition toward insufficient potassium absorption. But I'm a computer goon, what do I know? On the other side of the equation, looks like I'm going to require a THIRD round of prolotherapy for my shoulder. 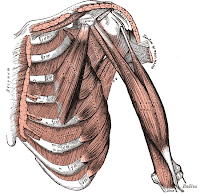 The first round resolved problems with my anterior deltoid. The second round worked on my rotator cuff. And (hopefully) the final round will fix my subscapularis muscle. Not keen on thinking what comes next if I'm not good after that. And this just in... ...Meg got a DOLLAR from the tooth faerie!